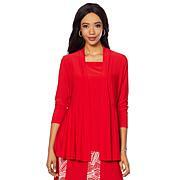 Slinky Brand 2pc Lattice Sleeve Tunic & Pant Set Comfort, style and versatility is all you need. Slinky has you covered on all fronts. Designed with a lightweight, wrinkle-resistant fabric, this dynamic duo is easy to wear and stays looking nice all day or night.